Get 30% off all GrabHitch rides for 3 days! GrabHitch allows anyone with a car to pick-up and drop-off people going along the same route in exchange for a fee. Share your transport to work and save on your travel costs while networking along the way! Just for you, GrabHitch is taking 30% off all GrabHitch rides! 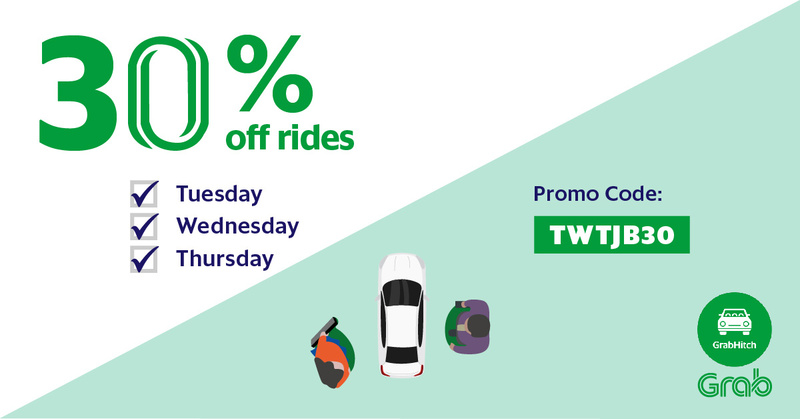 From 18 October 2016 (Tuesday) to 20 October 2016 (Thursday), get 30% off ALL GrabHitch rides when you book at least 2 hours in advance with the promo code TWTJB30! Bookings have to be made between 18 Oct 0:00hrs 2016 to 20 Oct 23:59hrs 2016 to be eligible for the promotion. This promotion is not valid for fares exceeding RM30. This promotion is only valid for bookings which have been made at least 2 hours in advance.